Gwyneth Paltrow won my pick for Best Dressed this year at the Oscars. She looked stunning in her white Tom Ford gown. I wasn't a huge fan of her red carpet cape, but give her props for waiting to reveal the full dress until the actual show. Maybe the Oscars would get more viewers if other leading ladies did the same. What was your favorite dress this year? Were there any that you hated? I totally agree- Gwenyth looked amazing! My other favs were Emma Stone and Michelle Williams! Loved their gowns! I was obsessed with Emma Stones!! just amazing! Gwenyth Paltrow's and Emma Stone's are my favorites! Yeah, she was pretty amazing! She looks so great in white. Gwenyth was a-mazing in that white dress. And I have to say, I loved the cape. 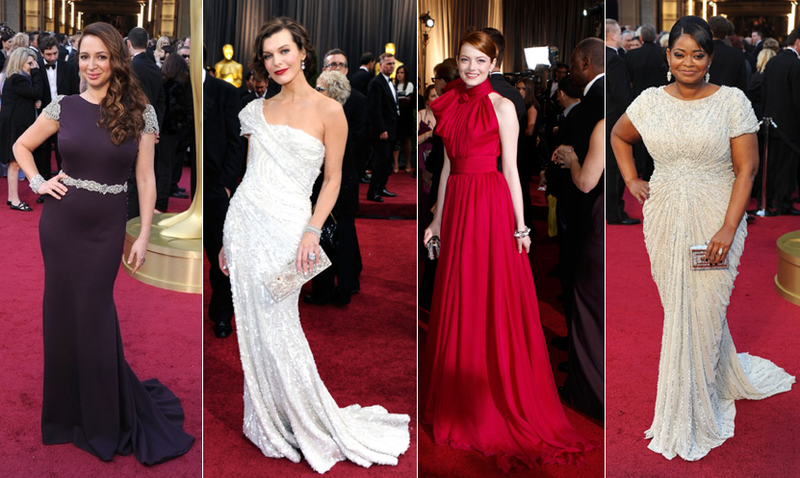 Milla Jovovich was my runner up and for my third pick I loved Jessica Chastain's black and gold Alexander McQueen. Different yet classic beauty.